The following afternoon, along with my dear wife and Doctor Hirsch, Holmes and myself travelled by train to Yorkshire – the town of Thirsk, to be precise – and took rooms at The Golden Fleece, an old coaching inn. Most of our journey had been taken up with planning our ‘expedition’ to what my large-nosed companion referred to as the crime scene. Judith filled us in on the gory details of her own encounter on the moors and was keen to caution us to the dangers of wandering about on that place of rolling hills and upland fells after dark. “Explains what?” said I, with not a little irritation. “Why you never carry any Swan Vestas.” He shook his head and peered out of the window. Mary had been listening intensely to this exchange and I could tell from the way her wonky eye glared at Holmes, that she was about to erupt. I leaned forward with a view to patting her knee in a calming manner, but it was too late. “What’s that, m’dear?” said Holmes distractedly. “Well, I…” he began, but Mary was far from finished. Holmes appeared taken aback (an unusual experience for him), and for a moment words escaped him. Now it was Judith’s turn to take up the protest, but not before laying a hand on Mary’s thigh and rubbing it with a gently calming motion. The effect was quite extraordinary. I am accustomed to my wife’s anger subsiding gradually over several hours, but now it petered away as if she’d been injected with a some fast-acting tranquilising solution. Letting out a low sigh, she turned her head towards Judith and smiled shyly. 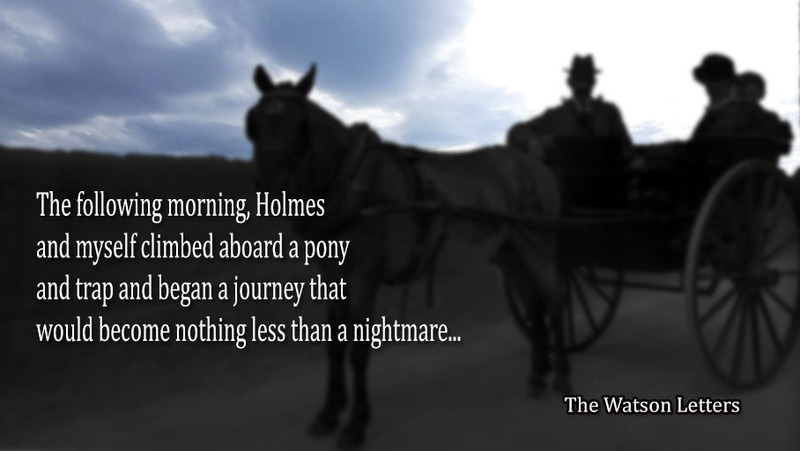 The following morning, Holmes and myself climbed aboard a pony and trap and began a journey that would become nothing less than a nightmare, though we little did know it. I had, of course objected to his plan to ‘outwit the ladies’ under the pretext of having a game of darts with the chaps in the bar, but Holmes can be very forceful, and he ably manoeuvred me through the Lounge Bar, into the Snug and out into the back lane via the kitchen, leaving Mary and Judith to discover our deception when we failed to return to our rooms for morning coffee. “You really expect we can get back here before dark?” I asked him. dour-faced man to hurry-it-along and within a few minutes we had reached the edge of the moors. The way ahead was indeed one of beauty and tranquillity as Judith had described, but already the mist was descending over distant woodland and the familiar loosening sensation that often accompanies our many journeys into the unknown, began to make its presence felt in my lower quarters. I only hoped I’d be able to hold onto my dignity if we should encounter the individual – man or beast – who assaulted Judith. As it happened, messing my pants was the least of my worries. Ah that Sherlock, he is a most arrogant chap, Colin. As crazy and as good as ever … ah, Swan Vestas … now that brings back memories … Moreland’s Matches and all that … England’s Glory! Yes, wonderfully English, old bean.